If you’ve contemplated becoming a Spinning® instructor and participating in our comprehensive one-day workshop but haven’t taken the plunge, now is the time. Led by a Spinning Master Instructor, the training prepares you for the online Spinning Instructor Exam and provides you with the knowledge and skills to become a dynamic indoor cycling leader. You’ll learn everything from Spinner® bike setup and safety, cycling biomechanics to creating motivating class ride profiles, and learning the art and science of coaching. Not only will you learn the science, philosophy and best practices behind the Spinning program, but also becoming an instructor can be rewarding because you'll change lives along the way. From inspiring a new mom to lose post-baby weight to coaching triathletes preparing for a race, you'll be an integral part in people's lives. This is what motivated Belgian Master Instructor Peter Pastijn to get certified. “As an instructor, it’s all about sharing and helping people to get fit and reach their goals,” he says. “It’s such a privilege and such a pleasure to do this.” Pastijn also appreciates that Spinning is grounded in road cycling and applies this practical knowledge and exercise science to every element of the program. Master Instructor Lucian Marcial-Vincion, of South Carolina agrees. “For me, the attraction to Spinning was its rootedness in science,” she says. Marcial-Vincion took her first Spinning class in the instructor training. “I was working for a facility that said, ‘We’re getting this thing called Spinning—go get certified!’ I had never even taken a class before!” she admits. Fortunately, the Spinning program is accessible to all individuals and Spinning Instructors come from a wide variety of backgrounds. She quickly learned the principles of the revolutionary indoor cycling program and began teaching. In addition to lending their years of experience in the field and countless hours on the Spinner bike, Master Instructors provide hands-on experience and practical coaching. The training comprises both lecture and riding time. 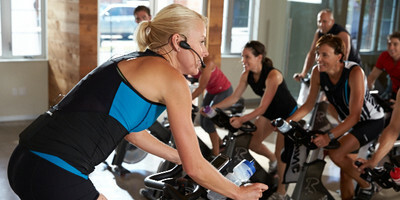 You’ll learn everything from the main hand positions and movements, to the benefits you’ll receive as a SPIN ® member. Additionally, you’ll meet other fitness professionals who share your interests and goals. It’s well-known in the industry that Spinning instructors receive top-quality education and training, but it goes beyond the initial workshop, offering numerous ways to advance your knowledge. After you attend the Spinning Instructor Training you’ll receive a 6-month complimentary access to SPIN® Association, the exclusive instructor benefits and content program by Spinning. You’ll also gain access to videos, SPINCasts, articles, newsletter quizzes, discounts on apparel and other Mad Dogg Athletics affiliate benefits. You’ll also have the opportunity to attend the World Spinning and Sports Conditioning Conference. Finally, the Spinning Instructor Certification Program allows instructors to earn SPIN® CECs and ACE, NASM, and AFAA continuing education credits (CECs).Whatever your rationale, becoming a Certified Spinning Instructor has myriad benefits to enhance your fitness career and help you change lives.